Through primary legislation the government would introduce, you would have to live apart for two years before getting a divorce. THE WORDING OF the proposed amendments for the divorce referendum has been announced by government. Justice Minister Charlie Flanagan today announced the wording for the amendments to the constitutional provisions on divorce that will be voted on by the Irish electorate in May. At a Cabinet meeting today, ministers today discussed the amendments to be proposed in the referendum – which is due to take place on the same day as the local and European elections on 24 May. If the referendum is passed, the government would introduce primary legislation on the time period before you can get a divorce, rather than having it in the Constitution which must be put to a public vote when changes are proposed. Under the current system, married couples need to have lived apart for at least four years during the previous five years. The new proposals would see that reduced to just two years, with the Oireachtas providing the legislation for this. “This important referendum will allow the people of Ireland to have their say on an issue that unfortunately affects people across the country,” Justice Minister Charlie Flanagan said today. “The irreconcilable breakdown of a marriage causes immense sadness and stress for all concerned. 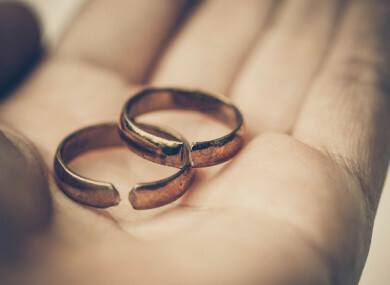 Under the proposals, other aspects of divorce – such as only a court may grant a divorce, that there is no prospect of reconciliation, and that there will be proper provision for spouses and children – will continue as part of the Constitution. The other aspect of the Constitution that will change if the referendum is passed relates to the recognition of foreign divorces. Email “Government announces wording of amendments for the divorce referendum”. Feedback on “Government announces wording of amendments for the divorce referendum”.